ShowerMan’s mission is simple. As the industry’s most respected shower door specialists, we aim to provide a world-class experience with the broadest range of products and services, superb technical expertise, integrity and strong business ethics. When you come to us for your custom glass for showers or frameless tub enclosure, we do more than sell you a great product. We educate you and help you determine what’s best for your specific needs. That’s the ShowerMan Way. ShowerMan raises the bar for industry standards as the top-rated installers of custom glass for showers and frameless tub enclosures. We are passionate about serving our customers with the highest level of integrity, and we are committed to exceeding your expectations. We know that not all shower doors are created equal, and that’s why we use only the highest-quality materials. You can expect constant communication, and a job that is properly completed and measured to perfection. Nobody expects more from us than we do. We live up to this belief every day through personalized customer service, and impeccable product selection and knowledge. 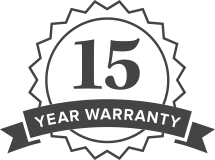 We pride ourselves on our personalized customer service, providing an unprecedented 15-year warranty on the quality of our work. Contact us at 732-303-9044 or fax us at 732-303-1836 and let us show you all we can do!